Regina Heinz from London is internationally known as a ceramic artist, lecturer and designer, but this spring she is breaking into a new market with the launch of her luxurious sculptural tiles and feature walls on display for the first time at the Crafts Council stand at Design Days Dubai 2016, March 13-18, 2016. 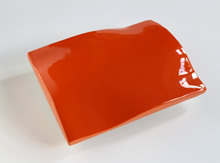 Regina says: "I am delighted to have been chosen by the Crafts Council to exhibit my work at Design Days Dubai. British craft has a strong heritage and is revered around the world for its quality, energy and innovation. The Crafts Council supports makers to realise their ambitions to work with international clients including collectors, galleries and retailers by showcasing their work at world-class design fairs across the world such as Design Days Dubai." For further press enquiries please contact Sara Khan at s_khan@craftscouncil.org.uk or 020 7806 2500. Regina Heinz has been specialising in innovative and artistic architectural ceramics since 2011, when she was asked by the leading American tile retailer Ann Sacks to design a unique line of art-tiles. Inspired by water and the lakes of her home country Austria, Regina has since created undulating 3D tiles with soft and smooth lines that are tactile and sensual. Fluid forms are perfectly fused with geometric design and beautiful ceramic colours. These sculptural wall units can be combined and tessellated into striking feature walls that introduce rich ceramic surfaces and a touch of the natural world into architectural spaces at any specified scale. 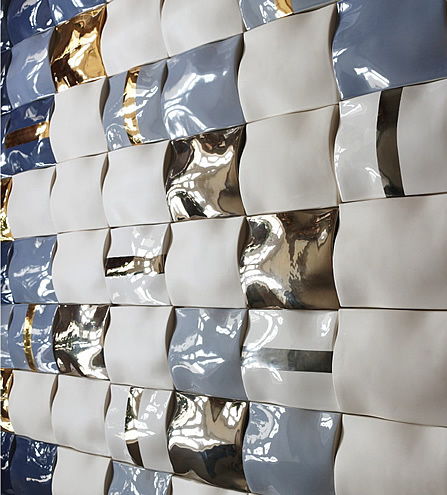 On show will be a 2x2 m large-scale ceramic feature wall comprising 108 modules. 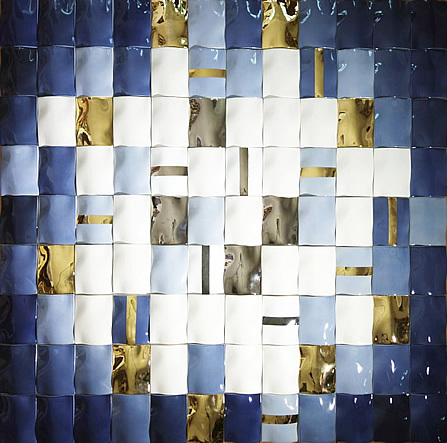 Highly reflective tiles glazed in glossy shades of blue are combined with matte-white and luxurious metallic surfaces in gold and platinum, creating a stunning illusion of light reflected in water. Indeed, Water is the inspiration for the new collection and has been a recurring motif in Regina's ceramic work, effortlessly translated into fluid forms and abstract flowing designs – some gestural, some geometric. Regina says, "I see the wall pieces as a continuation of the age-old tradition of tiles, friezes and reliefs used to articulate and adorn architecture – conceived in a new, contemporary idiom. Their three-dimensionality enlivens the flat plane of the wall and adds rippling patterns of light and shadow. The Arabic world has a long tradition of architectural ceramics. I am thrilled to present my work in this context and expect a good reception. The sophisticated audience in Dubai will understand and appreciate my new tile range, which is exclusive and bespoke so you won't see this collection anywhere else. Each panel is unique and designed to complement its luxurious setting." The modules measure 20x15x3 cm and are suitable for interior and exterior use. They employ a palette of traditional ceramic skills including hand-painting, printing, high-gloss and matte glazes and precious gold and platinum finishes. Colours, glazes and designs are carefully chosen in consultation with the client making each panel a one-off. Regina Heinz studied Fine Art and Ceramics in Vienna, Geneva and London and has worked from her ceramics studio in South London since 1998. Her award winning work has been purchased by the National Art Collector's Fund and is held in major collections worldwide including the Fitzwilliam Museum in Cambridge, England and the Museum of Contemporary Ceramics in Gifu, Japan. Regina regularly works with international interior designers, art consultants and private clients. Her portfolio includes an exclusive 3D tile line for the American tile retailer Ann Sacks, residential commissions for private clients in England and Saudi Arabia and a series of sculptural wall pieces for 2000 cabins of P&O's luxury cruise ship Britannia, launched in 2015.